In contrast to other wiggles, the temporal wiggle does not wiggle in space but in time. 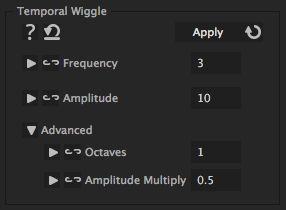 Applying a tempral wiggle is like manipulating a property as if you would randomly move the current time indicator back and forth around the current time. This does NOT mean that you have to apply it the time remap property - you can apply it to any property. As moving back and forth in time only makes a difference for animated properties, if makes only sense to apply this iExpression to properties for which you keyframed some change over time. Example: Lets assume you have keyframed the motion of some layer and apply the Temporal Wiggle to it with an amplitude of 2. Then at frame 200, it might take the value of frame 198 (wiggle 2 frames backwards) and at frame 201, it might take the value of frame 202 (wiggele 1 frame forward). If you increase the amplitude to 10, it might also take the value of frame 190 at frame 200.